﻿ The Sukhothai Bangkok (Thailand) | FROM $130 - SAVE ON AGODA! Have a question for The Sukhothai Bangkok? "Perfect for a Business hotel." "Beautiful hotel with good service, very impressive." "I come to this hotel since many years and it is always a pleasure." "Wonderful interior design of modern Thai style, traditional..."
Stay at the Sukhothai Bangkok and treat yourself to a luxurious and unforgettable getaway. The rooms at this property have city, pool, garden, and courtyard views for guests to choose from, so you are bound to be peering out at breathtaking scenery. This property is near landmarks and attractions such as Surapon Gallery, Bangkok CityCity Gallery, Goethe Institut, Red Bull X Park, and St Andrews International School Sathorn Campus. It offers various facilities for guests to enjoy, such as a fitness center, a nightclub, a garden, a sauna, and an outdoor swimming pool. From a bar to restaurants on-site, it offers a selection of dining and snacking choices. The Sukhothai Bangkok has numerous convenient features, such as an infirmary, a salon, a currency exchange, a laundromat, and a selection of shops. It features a kids club, giving your children a safe place to play and have fun. To make your vacation truly relaxing, you can take a break from your other activities and pamper yourself for a few hours with a massage. With guided tours available, the Sukhothai Bangkok is a great spot to stay to learn about the area and see everything you can while you're here. The Sukhothai Bangkok has free Wi-Fi in all rooms, in addition to Wi-Fi in common areas, so you can connect to the internet from anywhere. From a concierge to dry cleaning services, the property has a range of convenient services to ensure that you get the most out of your time in Bangkok. The front desk is open around the clock, so there will always be a member of staff on call to help you. English, French, Korean, Mandarin, Japanese, and other languages are spoken at this location. The Sukhothai Bangkok is pet-friendly, so you won't need to worry about finding a pet sitter for the time that you'll be away. The Sukhothai Bangkok offers an assortment of transport options, such as airport transfers, car rentals, and shuttle services, getting you that much closer to all there is to do in the area. Lumphini MRT Station is 590 m away and Sala Daeng BTS Station is 900 m away. The nearest airports are Don Mueang International Airport (DMK) and Suvarnabhumi International Airport (BKK), which are situated 22.3 km and 23.1 km away. Check-in is offered from 02:00 PM, and check-out is from 12:00 PM. The Sukhothai Bangkok provides express and 24-hour check in and check out, enabling you to conveniently choose the service that best suits you. "I appreciate the professionalism of all the staff, including..."
The Courtyard Room is guaranteed with late check-out until 02:00 PM and 2 pieces of clothing for pressing service per day. My husband and I celebrated our first wedding anniversary at the Sukhothai. From the moment we sat down to check in, everything was perfect! We are actually so pleased with the hotel and staff that we have decided to make it a tradition to celebrate our wedding anniversary at the Sukhothai, if possible! The staff were really attentive, and we were happy with the little things that they did to make our stay memorable. Oh, and the breakfast buffet is definitely one of the best. We were sad to leave! It was indeed a peaceful moment staying in Sukothai Bangkok. I stayed in a suite room which wasn't expensive compared to other high-end hotels in Bangkok. Its renovated pool was amazing and every staff there was very helpful and kind. I'd definitely visit there again on my next visit to Bangkok. I've reviewed The Sukhothai Bangkok a number of times for Agoda. We go here every year, to begin, and finish off our trips throughout Southeast Asia. It really does feel like coming home. They finally finished the Gym and pool area, which is as professional as any Gym I've ever used. The pool area is fantastic, as well. My only wish was, that they had a separate area for children, whose parents, don't seem all that interested in parenting. I don't mind children, but I do mind screaming misbehaved ones. Other then that - great work. I can't say enough about the concierge service with Toomb; he's always helpful, and answers my every question with ease. I appreciate the professionalism of all the staff, including the dining room, reception, etc. We usually book a Superior Room on the 4th floor - which is big, has a great, comfortable bed, and large clean bathroom. We will be back - thank you so much for your dedication to making your guests comfortable, and at home. Told them how bad the lobby’s scent is several times already. Smells like cheap hookers. They still haven’t considered changing. Go figure. 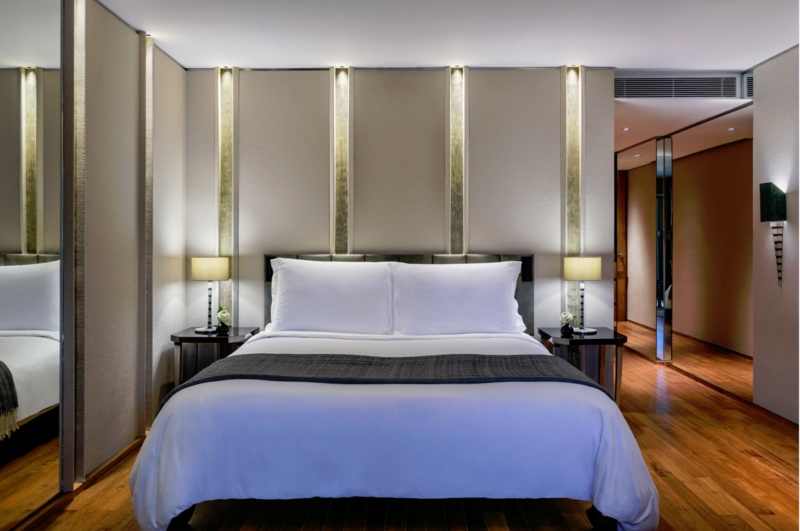 Upon arrival to The Sukhothai, it was like an exclusive oasis in the bustling metropolis of Bangkok. The architecture of the late Kerry Hill never disappoints to charm you with the simplicity of the layout and the emphasis on the ancient Sukhothai's element, of peace and tranquility. The check-in was dealt professional and patiently, with much attention and care. The staff, Ms Gift, took notice of my nearing birth date during registration and arranged for a birthday cake on the last night stay. The room we got was the most basic but yet the services rendered was of the most exclusive suite accommodation standard. The daily fruits replacement, making the bed in the day upon finishing our breakfast and prep the bed in the evening. The breakfast was refined and exquisite. The facilities are excellent and they are constantly upgrading. Hope to be back again and enjoy the Sukhothai impeccable hospitality and professionalism throughout our stay. Kudos! I'll definitely come back again. I stayed again at my favorite hotel in Bangkok - The Sukhothai Hotel along Sathorn Road . In my 20 years of visiting Bangkok , Sukhothai's concierge duo of Khun Toom and Khun Kook have provided the best concierge service I have ever experienced. On this recent trip, I had asked for an empty box, to pack items I had purchased and samples from my suppliers. Not only did Khun Toom find me the suitable box for my goods , he also also completed th packing, sealing and even placed the appropriate belting around the box for easy carrying and check in!! Thank you very much again to Sukhothai's dynamic duo and the whole concierge team of this wonderful hotel . For me one of the top 5 hotels in Bangkok, I would stay here more often when it would be located on the river. The service and the rooms are excellent and the bathrooms are one of the best in Asia. The only drawback is the location especailly during the rush hours. A very classy hotel with nice spacious room equipped with modernized facilities. And the pool is so big with sun shines all day around, you never need to fight for a suntanning bed as there are plenty. The staff of this hotel has always been impeccable . This is the 3rd time I am staying at this hotel. They really take good care of you and are always pleasant. The concierge Khun Toom even called my Grab driver to tell him to take me back to the hotel , when I was on my way to the airport, because I left my jewelry in the room!!! Great service! Most of the staffs are familiar with me and their maintenance of professionalism makes me feel so comfortable and at home! Their hospitality surpasses most hotels. Service is impeccable. Love the way they move with me. Whilst at the same time, they might want to review the choices of food they offer in their in room dining menu and the outrageously exhorbitant charges that goes with it. Even by International standards comparison, it’s still way off the charts! The service and staff was impeccable, beautiful place they have here. Also room service and room was amazing could not fault. Even though we just stayed one day they organised a cake for our anniversary and tidied our room as we went out for lunch and dinner in Bangkok. Definitely would recommend to any friend. A very beautiful hotel. The staff were most polite and friendly from the moment we arrived at the hotel and throughout our five-night stay. They were also responsive and efficient and we did not have to wait long for any service. They were attentive, communicated well and understood our enquiries easily. The room was very comfortable and clean and well provided with toiletries etc. Highly recommended! The bed is very comfortable, and should be the best hotel bed I ever laid. The room is large and in-room equipment are enough. The only thing needed in the room is to have more power socket. There's only 1 power socket (with multinational ports) on the desk, and it's not working sometimes. All other power sockets are located either behind the coffee machine, or at the corner of the room. They're not supposed to be used by guest but for other purpose (e.g. coffee machine, lamp.....). Other hotel facilities like swimming pool or gym room can't be found here. If you want to do some workout in the hotel, you may consider this as well. We go back to The Sukhothai Bangkok every year. It's an oasis in the middle of chaos. Highly recommended. Tranquility within Bangkok, very friendly and helpful staff. The Thai restaurant is highly recommended. Only downside is there’s always a bit of traffic at the main road outside and around 1kn from nearest BTS station. When i visited The Sukothai Hotel the first time, it was just for having breakfast with friends. But i immediately noticed the very friendly atmosphere! I travel a lot and i‘ve seen dozens of hotels, but the Sukothai is outstanding when it comes to excellent and friendly service! An oasis of quietness and elegance in the heart of Bangkok. Here you are treated not just as a guest, but almost as a friend! The rooms are elegant with dark wood furniture and very comfortable beds. The breakfast buffet offers everything you might want, ranging from classic western dishes to tasty thai dishes (different curries, soups) to delicious fruits and even sushi, all prepared with perfection. All in all an outstanding place to stay and definitely MY choice for Bangkok. Special thanks to Ms. Botan, Anchi, Eve, Sammy, Eye and Nam for giving me a smile every morning and making my stay at The Sukothai unforgettable! 😘I never experienced that before! I will come again for sure!! Beautiful and elegant hotel; large and comfortable room;. Great breakfast, excellent room service and very good Thai restaurant. There's a beautiful bar we unfortunately didn't try. The hotel is all about quality and attention to detail.